The opening rounds of the Super Touring Car Challenge and Derek Bell Trophy as well as four races for the FJHRA/HSCC Silverline Formula Junior UK Championship featured in the stellar programme for the Donington Historic Festival (4-6 May). The categories from the Historic Sports Car Club were prominent during the 19-race schedule at one of Britain’s most important historic race meetings, which ran in warm sunshine and in front of a big crowd of spectators. In the year that marks the 60th anniversary of the British Touring Car Championship, and its forerunner the British Saloon Car Championship, the HSCC Super Touring Car Challenge had a prime place on the weekend schedule. 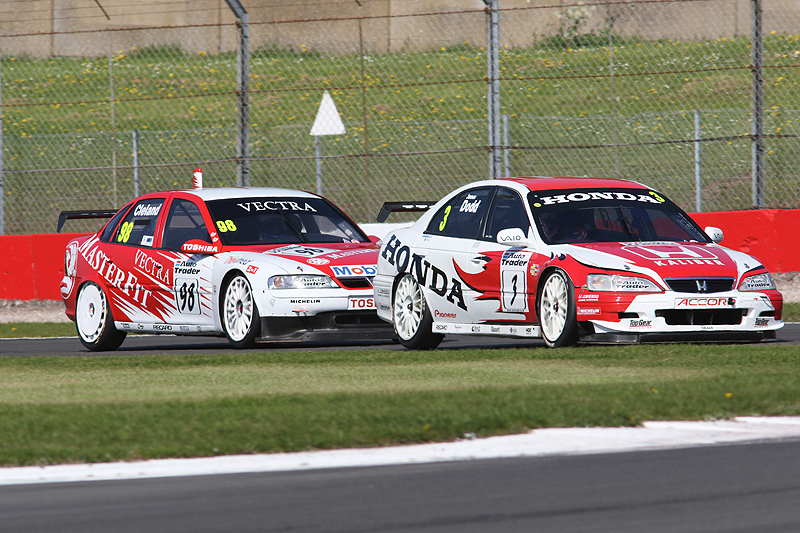 James Dodd duly took a Super Touring double despite a dogged pursuit by John Cleland (Vauxhall Vectra) in the opener. Dodd’s Honda Accord was not 100% right, but it was good enough to cap the field in both races. “It’s great to race against a legend like John Cleland,” said James. Class successes went to the BMW M3 shared by father and son Nick and Harry Whale and to Abbie Eaton in the thundering Holden Commodore, which rocketed into the top three on Saturday before dropping back as the race developed. 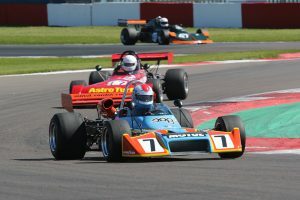 New to the Donington Historic Festival was a double-header for the HSCC Derek Bell Trophy and the powerful single-seaters were the fastest cars on track during the weekend. Michael Lyons (Lola T400) was the class of the grid and won twice. However, to his great credit Jamie Brashaw never stopped chasing in his March 73A and kept Lyons on his toes, particularly in the opening race. After the race, Brashaw paid credit to the tireless effort of his father in preparing the March. After being sidelined by an electrical gremlin in the opening race, Greg Thornton powered his ex-Sam Posey Surtees TS11 up the order to take the final place on Sunday’s podium. Top of the 2-litre cars, once Mark Dwyer’s March 742 was sidelined by engine issues, was the rare Motul Mk1 of David Tomlin, which ran strongly in both races. 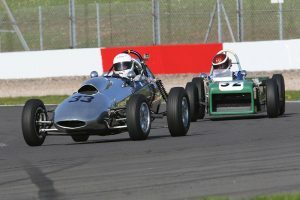 Two Formula Junior grids, featuring a total of 60 cars, formed rounds two and three of the FJHRA/HSCC Formula Junior Silverline UK Championship as the weekend marked the return of the category’s Diamond Jubilee World Tour to British soil. This event was the opening round of the final UK leg of the tour, which concludes with the grand finale at the Silverstone Classic in late July. The races delivered two wins for Cameron Jackson and single victories for Chris Drake and Ray Mallock. Jackson topped a quality rear-engined field on Saturday in his Brabham BT2, now back in period livery based on information supplied by commentator Ian Titchmarsh, and did exactly the same at the end of Sunday’s programme. In the first race, Jack Woodhouse beat off Sam Wilson and Andrew Hibberd in some tremendous Lotus battling. On Sunday, Wilson got away in second as Woodhouse narrowly beat Hibberd to the final place on the podium. In the opening front-engined race, Drake had squeezed his Terrier ahead of Ray Mallock’s U2 when an early chequered flag, due to a stricken car, denied Mallock the chance to retaliate. With brake balance re-worked to his liking, Mallock had improved pace on Sunday and he was able to edge clear as Drake found the Terrier misfiring over the later stages of the race.